1. Confirms the minutes of the meeting of the Community Services Committee, held on 26 February 2019, as a true and correct record. 1. Receives the report Chairperson's Report (R10126). 4. Notes that landfill gas levels are being monitored and remediation measures applied where needed. 1. 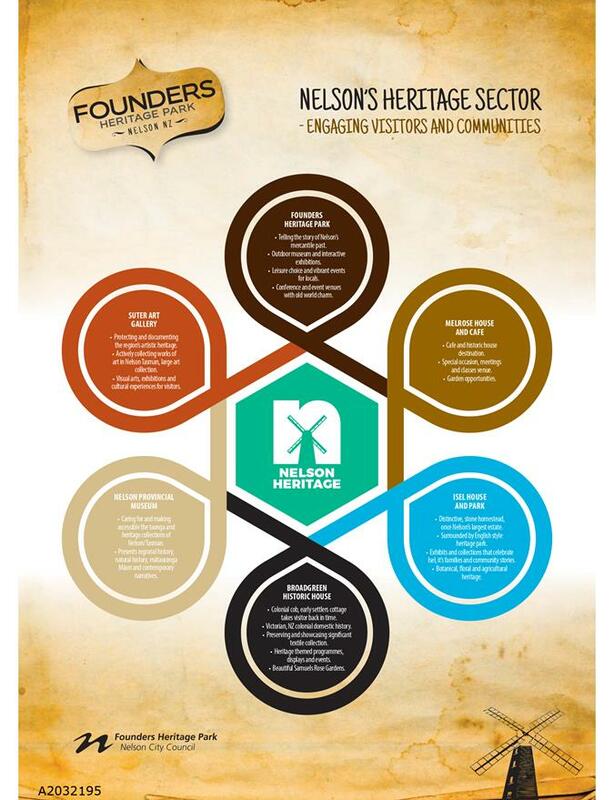 Approves the proposed five focus areas of the Founders Heritage Park plan as enhancing the visitor experience, building Iwi partnerships, heritage protection and sector integration, venue development and financial sustainability. 1. Receives the report Greenmeadows Centre - Progress Update (Number Six) (R10063). · Youth Councillors Emma Edwards and Holly Goulter will be in attendance at this meeting. 1.1 To update the Committee on current topics. 3.1 I am pleased to report (as you will see from the separate report) that the Community Centre is now ready for the community to use. Several sporting groups are now utilising space and the café has been running for some weeks. The Stoke Seniors are preparing to move across in the near future and we will be ready to have an open day for the public to come and see how the building performs. It has been a very long wait and we are so pleased and excited to be using this community facility. 3.2 I’ll be getting together with the Mayor and staff soon to look at plans for a community open day. 4.1 Paul Steere has been appointed Chair of the Community Steering Group to develop the Strategy and is forming up his team. Two meetings have been held so far and have focussed on the Strategy vision, process and focus areas. Staff are working on a baseline analysis of how age-friendly Nelson is. The Steering Group will be able to use this to assess priority areas for further work and it will be useful as a starting point to measure progress against as the Strategy is implemented. 5.1 I want to thank the Mayor, Rachel Reese and Councillor Barker together with the staff who joined me to visit our community housing residents. The purpose of our visit was to keep our residents up to date with the discussion at Council with the proposal to divest/sell our community housing to a provider in order to expand the capacity as our population ages. The feedback on this will be coming with the Annual Plan submissions. 6.1 Introducing the newest item in the children’s library: Grab Bags. Do you have visitors of the younger kind? Pop into the library and pick up a Grab Bag. Grab Bags make it easy for you to provide a variety of activities for your young visitors – each bag includes books, CDs, DVDs, a game and other activities. There are different bags for different age groups. 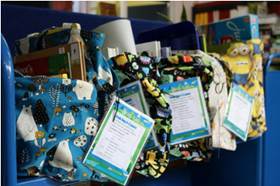 Ask in the children’s library for more information or to borrow a bag. They can be loaned for four weeks, at no charge. 7.1 I attended a book launch at the Nelson Library for “Keepers of History – New Zealand Centenarians tell their stories” by Renee Hollis. This was a well-attended book. Renee interviewed 3 people in the Nelson/Tasman region and their accounts are written in the first person making for an interesting read. 8.1 I have asked Age Concern Nelson Tasman to give us an update of some of the work they are doing and the following was prepared for us by Caroline Budge, Age Concern Manager. 8.2 There’s never a dull moment at Age Concern Nelson Tasman – whether it’s training rest home staff on elder abuse, recruiting new volunteers for our visiting services, organising the amazing Clydesdale horse Tyson to visit aged-care facilities, or meeting with teenagers to recruit them for Tea & Tech, we’re working hard on making Nelson the best place in the country to grow old. 8.3 Our biggest news recently has been the launch of our new AgeConnect website. This is at www.ageconnect.org.nz, and gives an overview of the initiative that we launched in 2017 to help build friendships and community connections for older people. It has a calendar of events and activities as well and anyone can submit something to be shared. 8.4 We’ve also just re-booted Tea & Tech for the year – this is an amazing initiative that brings together young volunteers aged 14 to 22 and matches them 1:1 with older people to upskill them on their devices. So far we’ve recruited Nayland and Waimea Colleges, and held sessions at Summerset in the Sun and Oakwoods. We’re also working with the Nelson Youth Council on this, and plans are afoot for community sessions as well. 8.5 All in all, Age Concern continues to innovate and work in collaboration with other agencies and organisations in providing information, support, advice and opportunities for older people to connect with their communities and keep socially contacted. 9.1 Nelson Heritage Festival is in full swing for the month of April and has again grown in scale with over 60 events this year from last year's 44. Some key new partners, including Theatre Royal and Centre for Fine Woodworking, became Event Hosts in 2019. The Festival runs throughout the whole of April. Demand for the grant fund was oversubscribed by $10,000 this year showing the increasing interest in the Festival from the community with $25,000 allocated to groups hosting events. Festival highlights include Justin Eades the Wairau Affray at the Suter Theatre, the Let the Band Play on tea dance at the Boathouse on World Heritage Day as well as numerous activities for young and old. The 2019 Nelson Heritage Festival report with key stats from this year's events will be available in June. 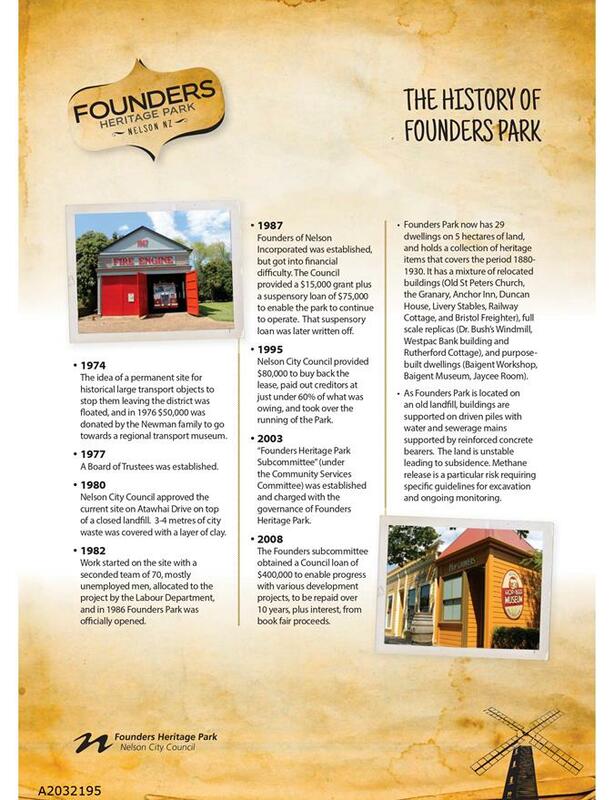 1.1 To confirm the timeline and focus areas for an update of the Founders Heritage Park strategic plan. 2.1 Founders Heritage Park needs a plan to re-define the visitor experience, enhance heritage protection, tell Iwi stories and develop the Founders venues. The current vision, mission and strategic goals are included in the Heritage Activity Management Plan 2018. 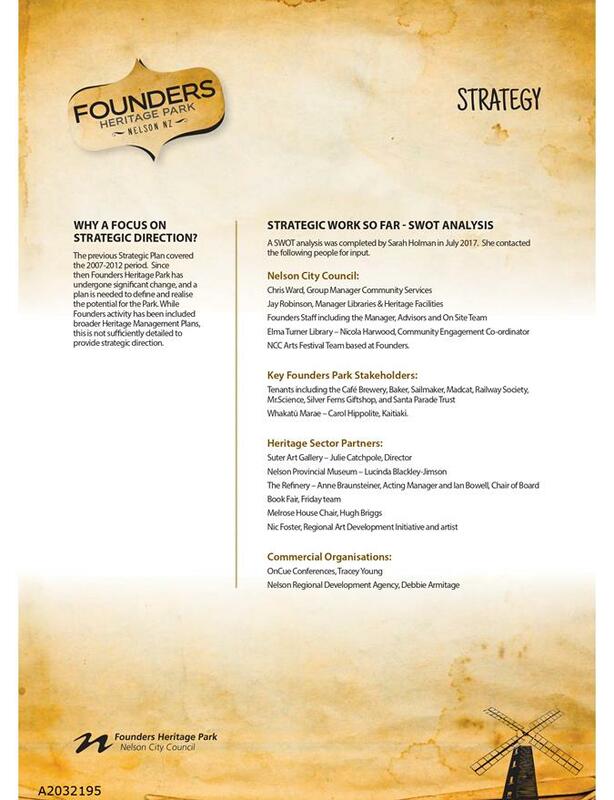 2.2 A strengths, weaknesses, opportunities and threats (SWOT) analysis was completed with Heritage and Founders Park stakeholders in 2017 to inform strategic priorities. All of the stakeholders emphasised the need for an updated plan. A Community Services Committee workshop was held on 30 August 2018 to introduce strategic priorities, focus areas and resourcing implications. 2.3 This report defines the process and timetable for creating the new plan, with the intent that significant funding decisions are taken to the 2021 Long Term Plan for decisions. 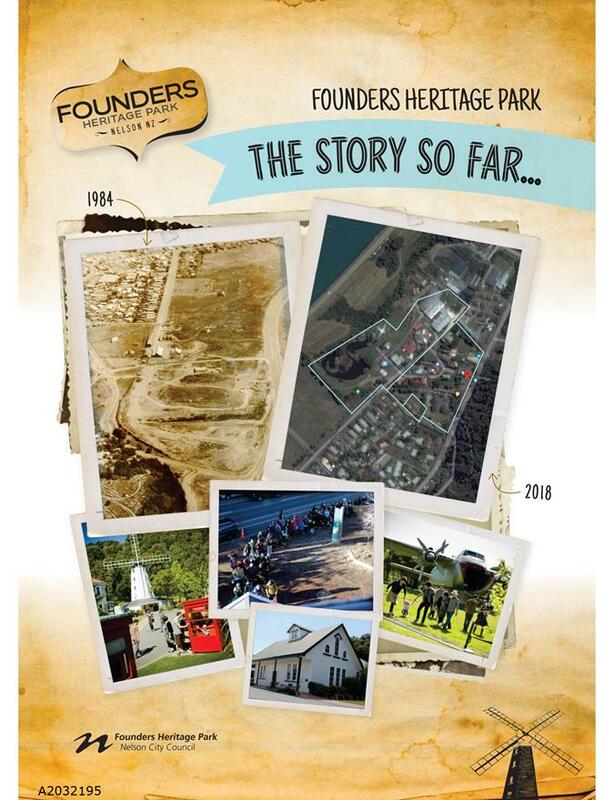 4.1 The current vision, mission and strategic goals for Founders Heritage Park are included in the Heritage Activity Management Plan 2018. Founders Heritage Park needs a strategic plan to develop this work further, including to define the visitor experience, enhance heritage protection, tell Iwi stories and develop the Founders venues. (a) Enhancing the visitor experience. Locals and visitors to Nelson will spend longer in the park, come more often, enjoy a variety of quality attractions and activities, and attend more events and festivals. (b) Building Iwi partnerships and telling Iwi stories. A shared cultural space will be developed and opportunities created for Iwi to share stories through displays and programmes. (c) Heritage protection. A focus on improving care of the collection and greater integration across the heritage sector. (d) Venue development. Improving displays, events and conferencing infrastructure. (e) Financial sustainability. Implementing a hybrid model where increasing commercial income from tenancies and events reduces dependence on rates. 4.3 Feedback from the Committee was that a new plan was needed to facilitate growth. There was general support for the ‘hybrid model’ and the concept of income from commercial activities reducing the ratepayer burden. Most councillors supported more conferencing at Founders, but some expressed mixed thoughts about whether conference facilities should be at Founders or the CBD. It was accepted that further investment is needed to support growth and prevent deterioration of heritage assets with a specific focus on increasing curator hours and budget to inventory and care for heritage assets. Also highlighted was the importance of improving partnerships with the heritage sector and museum. 4.4 The Committee supported investment into protection for the collection, cover for the aeroplane, a shared cultural space and warm and weathertight venues. Other options favoured by councillors were incorporating Iwi stories into existing displays, refurbishing the energy centre and granary, refurbishing the church, a dedicated staff member for developing displays and developing a collection policy. 4.5 Options less favoured by the Committee were significant investment in a new dual use display and conference centre, and significant investment in a commercial visitor experience display. 4.6 Recent testing for landfill gases at the park confirms a need for continuing monitoring and remediation where elevated levels are detected. 5.1 Council has set a community outcome of “Our communities have opportunities to celebrate and explore their heritage, identity and creativity.” A Long Term Plan (LTP) goal is that Founders Heritage Park is well used by residents and visitors. 5.2 The former Founders Park strategy expired in 2012. A new, aspirational plan will set the scene for Founders to develop as a premier visitor attraction for Nelson residents and tourists that will protect our heritage assets, strengthen Iwi partnerships and become more financially self-sustaining over the next ten years. 5.3 A SWOT analysis was conducted in 2017 with heritage partners, tenants, Iwi, volunteers and council stakeholders. Key themes were support for the ‘hybrid model,’ a need to define the Founders vision and scope, strengthening the marae relationship, better care of collections and heritage assets, more conferencing, an improved visitor experience and improved infrastructure. 5.4 Additional operating and capital expenditure is needed to develop Founders Park and improve the visitor experience. Consequently, it is proposed that Founders adopts a ‘hybrid’ business model. This involves an increasing amount of revenue coming from commercial activities, in particular business events, conferences and tenancies that cross subsidise non-commercial activities such as improvements to the visitor experience, park development and exhibitions. 5.5 Feedback from the Nelson Regional Development Agency and venue marketing officer is that there is real potential for Founders Park to considerably increase revenue from conferencing and business events, but this would require some infrastructure investment. Conference organisers generally love Founders Park as a potential venue due to its unique character. (c) continuing with the status quo. 5.7 Options such as increasing fees and charges are considered unlikely to significantly increase revenue. 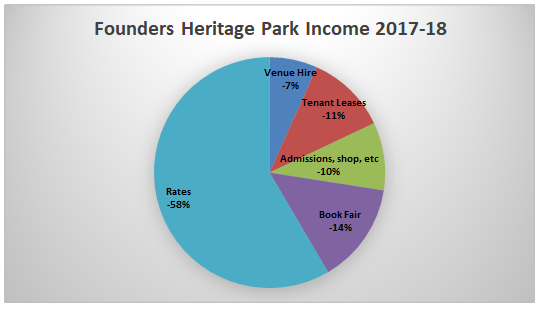 5.8 Just over half of Founders Park income is funded from rates, with the remainder coming from a variety of activities including the high profile book fair. 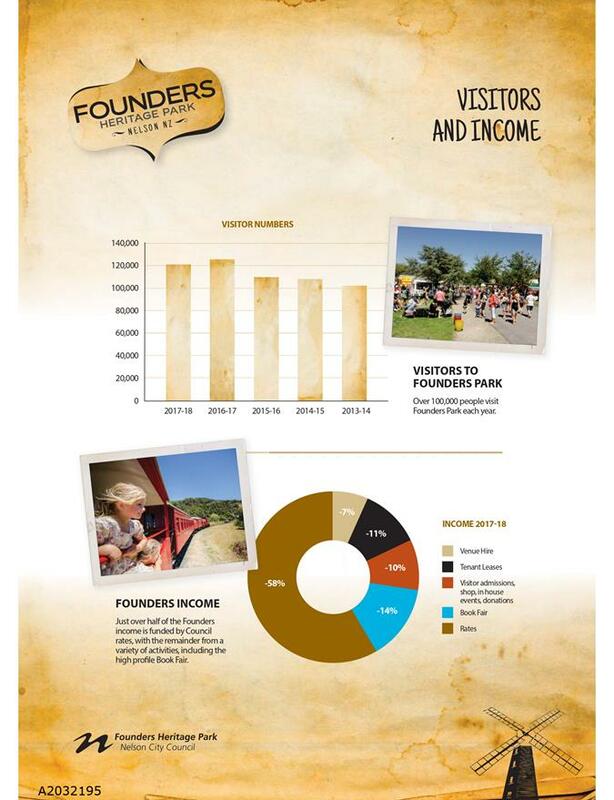 5.9 Founders Park Income 2017 / 2018 by amount. Mixed impressions by visitors, park not achieving potential. Increase visitor numbers and reputation. Not always relevant, not always open. Inconsistent contribution to visitor experience, lost sales. Tenants align with park character and are open at peak times. Great – when it is open. General expectation that food is available at a visitor attraction. Local visitor numbers drop if café is not open. Encourage café to consistently open during peak hours. No current partnership with Iwi and there are exciting untapped opportunities. Need to build an effective partnership. Develop an Iwi partnership alongside other arts and heritage activities. Kai fest is amazing. Need to better utilise the shared space. The shared space should be developed in partnership with the marae. Develop a plan for the shared space as an asset to both marae and Founders. Create a space in which to share Iwi stories and further the Iwi relationships. No pre-European stories are told. No Iwi or Maori exhibits. Founders does not yet reflect our bi-cultural Whakatu identity. Tell Iwi stories through displays and programmes. Founders Park identity is unclear. Founders role within the heritage sector is somewhat unclear with museum and heritage houses. Define collections policy and sector integration. Some assets are not adequately protected. Collections are not cared for adequately to industry standards. Risk of deterioration. Update and strengthen the collections policy, increase curatorial resource and storage. Relinquish items that don’t fit with the policy. Untapped conferencing and events potential. Potential source of revenue if investment is made in infrastructure. Improve conferencing and events revenue and associated benefits. Need for improved break out spaces and improved facilities in Energy Centre and Granary. Investment decisions needed by Council. Consider investment opportunities in 2021 LTP. 5.11 Councillors at the August 2018 workshop discussed potential priorities. Untapped opportunity to tell Iwi stories. Founders does not demonstrate an Iwi partnership. Need to develop Iwi partnership, develop the shared space and include Iwi stories into displays. Higher utilisation and yield potential for events and conferencing. Prioritise investment in these buildings. Improving and maintaining display quality is important. Benefits the visitor experience and protection of heritage assets. Increase the curator and collections resource. 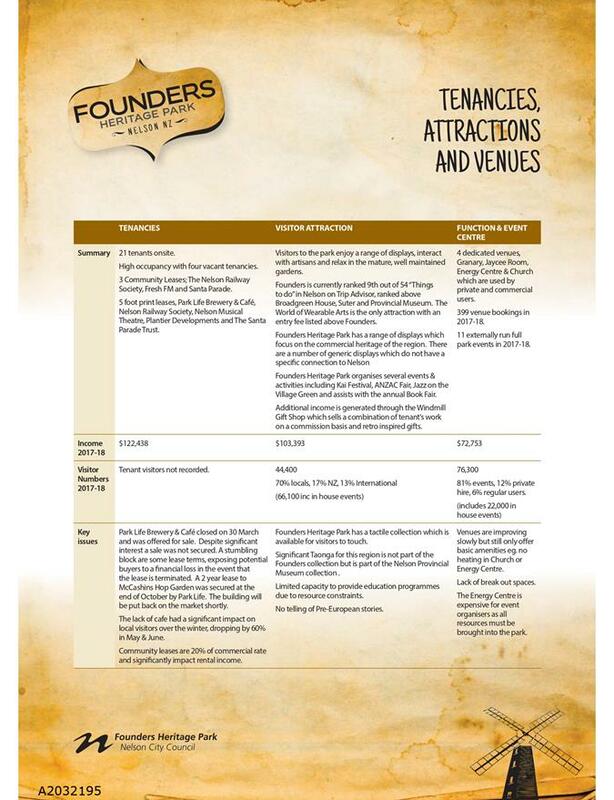 Founders needs to define its niche within the heritage sector. Collections will improve in quality, presentation and link with other regional heritage facilities. Allocate staff resource to developing the collections policy. 5.12 Officers will engage with heritage and Iwi stakeholders to create a draft plan for Committee workshopping with the Committee and final approval in December 2019. The plan will go out for public feedback but it is not envisaged that hearings will be required. 5.13 There is a low risk that developing the draft plan will take longer than projected. Timeframes could be stretched if stakeholders have diverse or strong views on the strategic direction for the park. This is somewhat unlikely due to the stakeholder engagement already undertaken during the SWOT analysis. 5.14 An action plan will be developed alongside the plan to define specific activities and projects, resourcing implications, risks, outcomes and timeframes. 5.15 The cost of feasibility reports or business cases needed to support capital investment decision making will be addressed via the 2020 / 2021 annual plan. 5.16 Any substantive investment decisions for Founders Park will be considered at the 2021 LTP. Activity Management Plans will be updated once the plan has been adopted. · Paves the way for work to start on a draft strategy. · Provides a structure, focus areas and timeframe for strategy development. · Provides a framework for the strategy to accommodate Committee, Iwi and stakeholder feedback. · Council does not need to commit financial resources to infrastructure development at this time. · Timelines could stretch if stakeholders do not agree with the strategic direction. · No expectations raised of future increased funding for capital works at Founders Park. 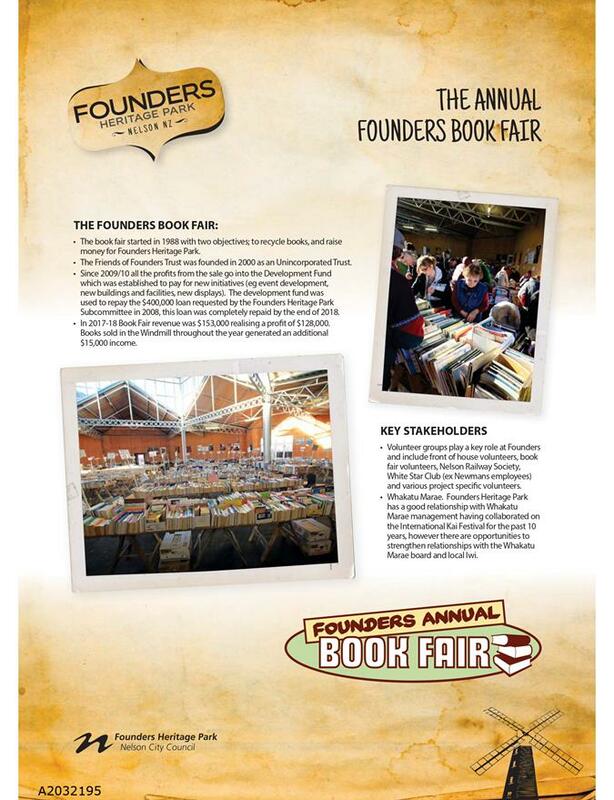 · Founders Park potential is not realised. · Heritage assets deteriorate over time. · Stakeholder and Iwi relationships deteriorate. 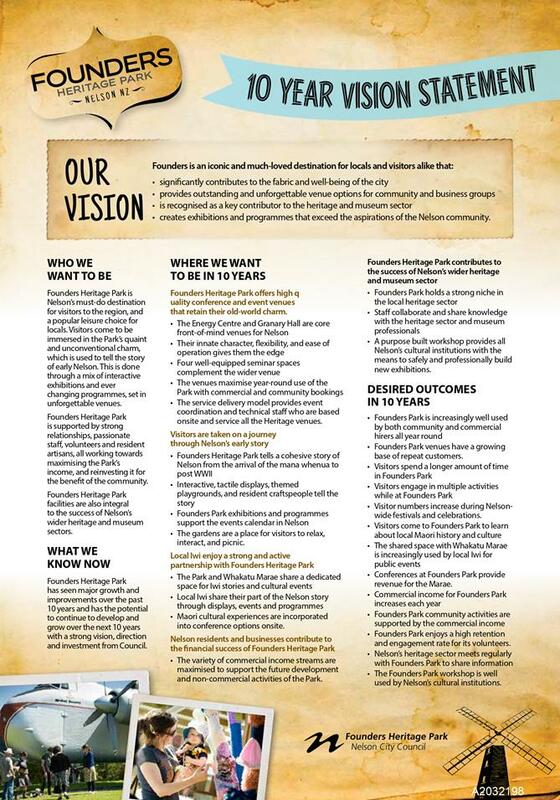 7.1 Founders Heritage Park strategic direction needs updating that will allow the park to realise its potential as an engaging, educational and busy visitor attraction, protect our heritage assets and reduce ratepayer dependence. A 10-year plan will provide the framework for this to occur. This project proposes to provide a strategic framework for Founders Heritage Park in a cost effective way that will allow an increase in income to offset cost to ratepayers. o Our Communities have opportunities to celebrate and explore their heritage, identity and creativity. There is a low risk that Council will not achieve its heritage goals if the development of the strategy is delayed. There is also a low risk that community or Iwi stakeholders may not agree with the proposed strategy which could delay implementation. There is a medium risk around raising expectations of an increased Council spend by community stakeholders. There is low risk associated with disappointment from the MenzShed that Council has not provided them with a permanent site. Financial decisions will be considered once the strategy and action plan have been developed, with any major investment decisions to be considered at the 2021 LTP. Council has already engaged with key stakeholders, and will continue to engage with Iwi and heritage partners as the strategy is developed. This strategy is anticipated to be of medium importance to Iwi, and Iwi engagement is planned via the Iwi Arts and Heritage Steering Group currently being established. Maori were engaged as part of the earlier SWOT analysis. Continuing engagement will be via the new Iwi Arts and Heritage Steering Group. · Development or review of policies and strategies relating to areas of responsibility. 1.1 To update the Committee on progress of the Greenmeadows Centre (the Centre). 3.1 On 20 March 2018, Council approved additional funding to enable the completion of the Centre and requested regular updates be provided to this Committee. This is the sixth progress update to the Committee and is to be read in conjunction with previous reports and report R10064 in the public excluded portion of the agenda. Detail covered previously is not repeated. 3.2 This will be the last update reported back to the Committee. 4.1 All work is substantially complete, with CPU issued for the entire building on 28 March. Practical completion is expected to be issued soon and this will allow all parts of the building to be used. 4.2 The building has now been completely “snagged” (minor repairs noted) and Watts and Hughes (W&H) are well underway in addressing these items. These minor snag list items will not affect the issuing of practical completion. 4.3 An open day will be scheduled in due course following discussion with the Mayor and Committee Chair. 4.4 Stoke Seniors have advised that they will take occupation of their area in May to accommodate key members who are on leave and not available in April. Their doors will be open to members as from 13 May 2019. 4.5 Stoke Rugby will be occupying their area from 1 April 2019 in line with the start of their rugby season. 4.6 Work on the Centre Management Plan is well underway, this being a requirement of the resource consent that will allow the Centre to be used for functions. 4.7 Acoustic testing will also be undertaken (as required by the resource consent) during the first functions. This will be coordinated by CLM who will be managing the Centre. 4.8 CLM (Council’s management contractor) will start taking bookings from 1 May this year. 4.9 W&H have continued to resource the project with qualified labour, with quality still the main focus. 4.10 There are no new risks associated with the physical works. The risks to Council include reputational damage and additional costs not able to be recovered. The facility has a high community interest and has a moderate significance to all residents, but is of higher significance to the residents of Stoke. · Community Centre and Halls, including Greenmeadows Community Centre. · Any other matters with the areas of responsibility noted above.